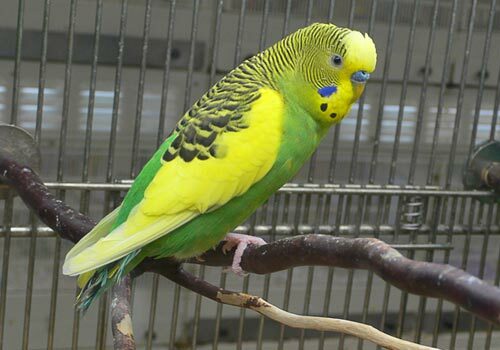 Holistic Select Weight Management - Chicken Meal & Peas Recipe 6/5 lb. 8 oz. 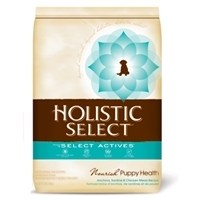 Holistic Select Nourish Puppy Health Anchovy, Sardine & Chicken Meals Recipe 6/6 lb. 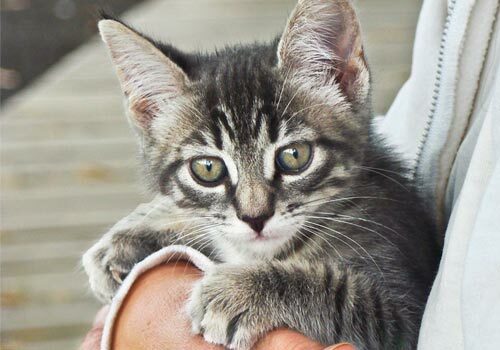 When developing our recipe for active and growing puppies, the equation for health is simple. We start with enhanced levels of premium proteins, fat and calories that growing puppies need. We then combine them with our unique Select Actives™ as well as additional benefits created to help your puppy grow up smart and strong. 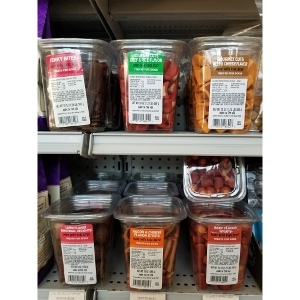 Holistic Select Nourish Puppy Health Small & Mini Breed Anchovy, Sardine & Chicken Meals Recipe 6/6 lb. 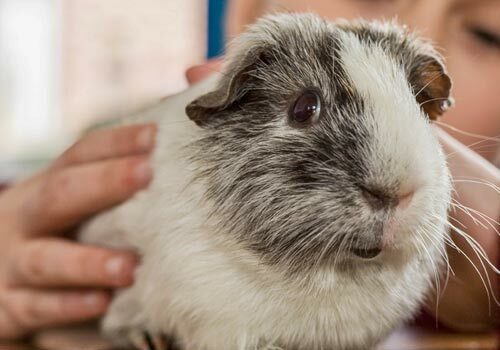 When developing our recipe for active and growing Small & Mini Breed puppies, the equation for health is simple. We start with enhanced levels of premium proteins, fat and calories that growing puppies need. We then combine them with our unique Select Actives™ as well as additional benefits created to help your puppy grow up smart and strong. 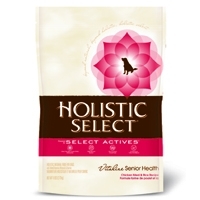 Holistic Select Vitalize Senior Health Dog Chicken Meal & Rice Recipe 6/6 lb. 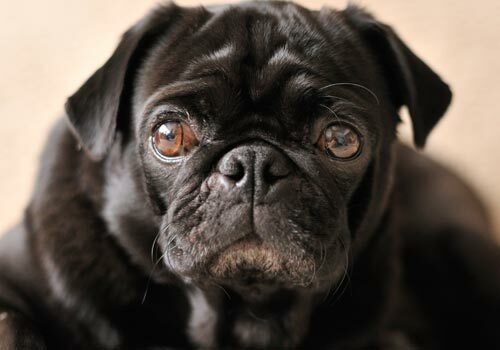 When developing our recipe for senior dogs, the equation for health is simple. We start with premium proteins, wholesome grains and healthy fat sources to support a slowing metabolism. We then combine them with our unique Select Actives™ as well as additional benefits created to keep your aging dog active and lively. Holistic Select Radiant Adult Health Dog Chicken Meal & Rice Recipe 6/6 lb. When developing our recipes for adult dogs, the equation for health is simple. We start with premium proteins, wholesome grains and healthy fat sources. We then combine them with our unique Select Actives™ to create a final recipe that delivers optimum natural nutrition for daily whole-body health. Holistic Select Radiant Adult Health Dog Lamb Meal Recipe 6/6 lb. When developing our recipes for adult dogs, the equation for health is simple. We start with a single premium protein source - Lamb Meal, wholesome grains and healthy fat sources. We then combine them with our unique Select Actives™ to create a final recipe that delivers optimum natural nutrition for daily whole-body health. Holistic Select Radiant Adult Health Dog Duck Meal Recipe 6/6 lb. When developing our recipes for adult dogs, the equation for health is simple. We start with a single premium protein source - Duck Meal, wholesome grains and healthy fat sources. We then combine them with our unique Select Actives™ to create a final recipe that delivers optimum natural nutrition for daily whole-body health. Holistic Select Radiant Adult Health Dog Anchovy, Sardine & Salmon Meal Recipe 6/6 lb. When developing our recipes for adult dogs, the equation for health is simple. 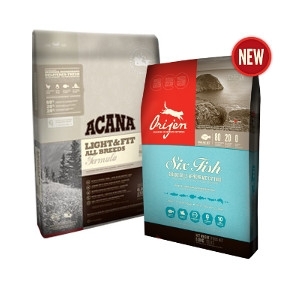 We start with a single premium protein source - Anchovy, Sardine & Salmon Meal, wholesome grains and healthy fat sources. We then combine them with our unique Select Actives™ to create a final recipe that delivers optimum natural nutrition for daily whole-body health. 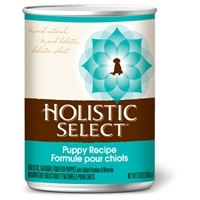 Holistic Select Chicken Can Puppy 12/13 oz. 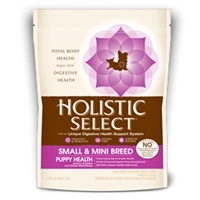 Holistic Select® Puppy Recipe is complete and balanced, with added vitamins and minerals. Our unique can recipes are made up of premium proteins, wholesome grains and a healthy medley of vegetables to deliver optimum natural nutrition for daily whole-body health. 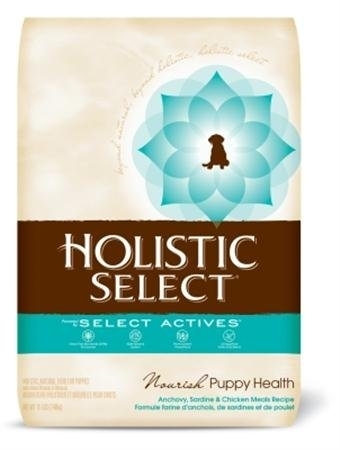 Holistic Select Nourish Puppy Health Anchovy, Sardine & Chicken Meals Recipe 15 lb. 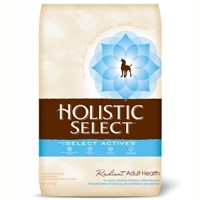 Holistic Select Radiant Adult Health Dog Chicken & Rice Meal Recipe 15 lb. Holistic Select Radiant Adult Health Dog Chicken & Rice Meal Recipe 30 lb. 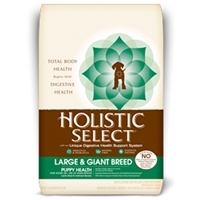 Holistic Select Radiant Puppy Health Large & Giant Breed Lamb Meal & Oatmeal 30 lb. When developing our recipe for active and growing Large & Giant Breed puppies, the equation for health is simple. We start with enhanced and controlled levels of premium proteins, fat and calories that growing puppies need. We then combine them with our unique Select Actives™ as well as additional benefits created to help your puppy grow up smart and strong. Holistic Select Puppy Health Large & Giant Breed Lamb & Oatmeal Recipe 15 lb. Holistic Select Radiant Adult Health Dog Lamb Meal Recipe 30 lb. 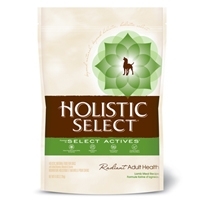 Holistic Select Radiant Adult Health Dog Anchovy, Sardine & Salmon Meal Recipe 15 lb.